The best thing about this trip was seeing my family. I cried buckets for 3 days. Seeing the people close to my heart after 2 years was what this trip was all about. In addition to that, it was also a reunion of Matt and his family from France, my brother and sister-in-law’s honeymoon and my son’s baptism. The rest were bonuses. First stop is ofcourse, Ayala Center Cebu, my favorite mall. During my highschool days, it was the go to place to hang out with my girlfriends, watch movies, walk around and do nothing but stalk our crushes. It was the “in” and “cool” thing to be in Ayala and that was how I spent my weekends. It has come a long way since then, it has expanded so much, even H&M and Zara are open! I enjoyed just walking around the mall, remembering those days, but now with a baby in toll. It was surreal to be back in my hometown but I loved every moment of it. The very thing I miss most about home, second to my mother ofcourse, is the food. Lechon, dinuguan, manggang hilaw with bagoong, humba, puto, puso, karekare, crispy pata, budbud with sikwate, sinigang, Julie’s, Dimsum Break, Potato Corner, Jollibee…and most especially BALUT! Oh just to die for! My mouth is watering just remembering all these. 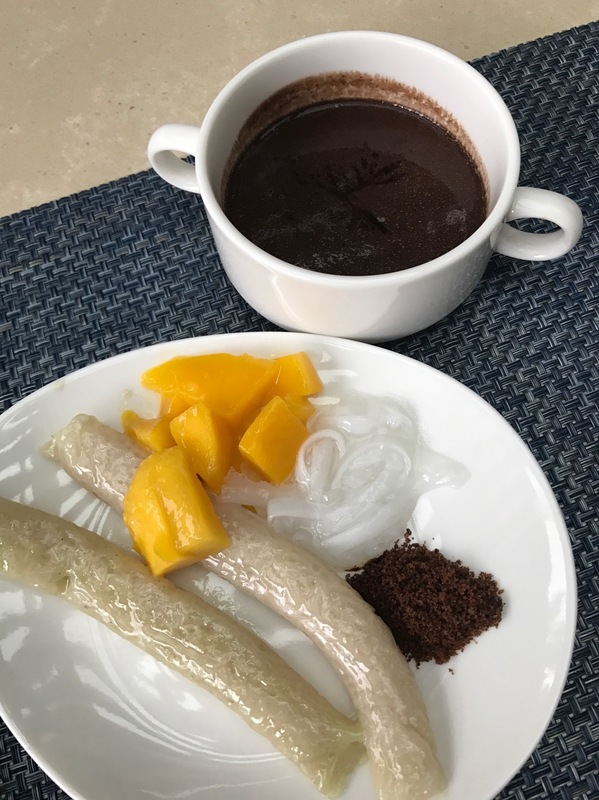 Filipino food is amazing but it’s the least known among all Asian cuisines. 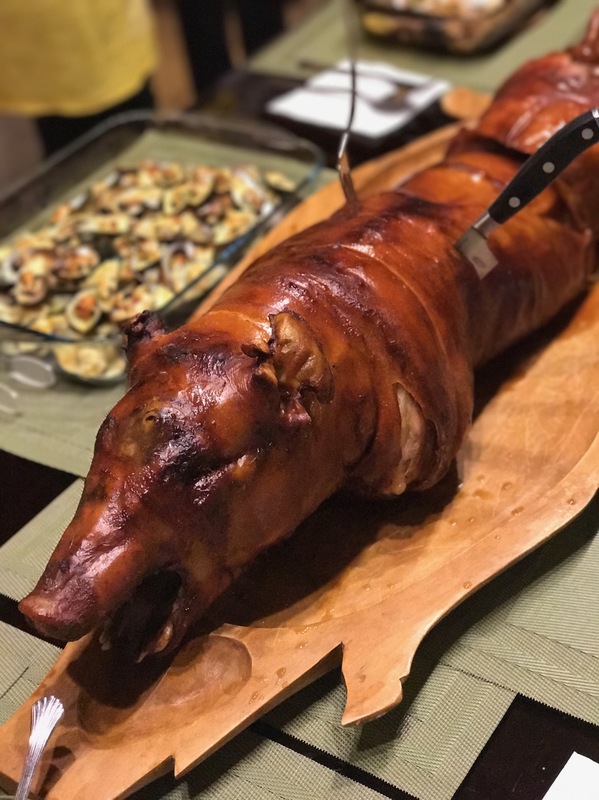 My in-laws, who have never tried Filipino food before enjoyed all the meals they ate, there was even a mention of opening a Filipino restaurant in Bordeaux. Matt was hesitant in trying Balut but I wouldn’t let him leave the country without trying one of my favorites. Celebrating my brother’s birthday at Rico’s Lechon. When I was a kid, I attended a wedding here and since then, I have always dreamt of saying my vows in here. As I grew up, I’ve seen a lot of churches equally beautiful if not, even better but my heart still wants this particular one. Stepping foot in here once again reminded me of that. I love the beauty of how old it is and the solemnity inside. We walked to the museum right beside but it was closed. The Frenchies probably had a bit of a culture shock from the street children even as young as 4 years old swarming over us and begging for money, my poor niece was speechless. I would love to bring Antoine back here when he is older and see how the other side of the world lives. I probably missed the class in my 2nd year of highschool when they talked about the arrival of Magellan in Cebu. The first thing that comes in my mind is that Lapulapu killed Magellan. As ashamed as I am to admit, I know very little of my city’s history but I know in 1521, Magellan introduced Christianity to the Cebuanos by giving the leaders this cross and the statue of the Baby Jesus. This cross is now housed in a little chapel just outside he walls of the Basilica. There were women selling different colored candles walking around the church, they say these candles symbolizes different things such as Love, devotion to Mama Mary, Health and Peace, Happiness, Success in work/studies/finances, Good Health and Safe travels. How I remembered all those is beyond me but in saying that, we bought 5 candles for PHP10 each. The woman performed a prayer ritual that sounded more like a song and she danced swaying her hips, moving forward and backward, her right hand holding the candles up high and waving it facing the cross. She said it would bring us miracles once we lit the candles as an offering. It was an enjoyable site to see. I‘ve seen it a million times but I still love it every single time. We, Cebuanos, are very devoted to the Sto. Nino and it was only proper to show them why. The Basilica Minor del Santo Nino Church is where all Cebuanos unite as one, especially on January where we celebrate Sinulog. From all walks of life, rich or poor, when we step foot in that Basilica, it doesn’t matter who you are, all that matters is you’re there for one purpose and that is to witness the miracles of the Baby Jesus, or as we call Him, The Santo Nino. It was really hot, sometimes there could be hundreds of people lining up but to our luck, the line was really short and we were able to see and touch the Sto. Nino in no time. I showed them how some people pray the rosary on their knees and make their way to the altar as a sign of their devotion and I also showed them where my dad used to go to school in his primary years. The beauty of Cebu lies beyond the city. 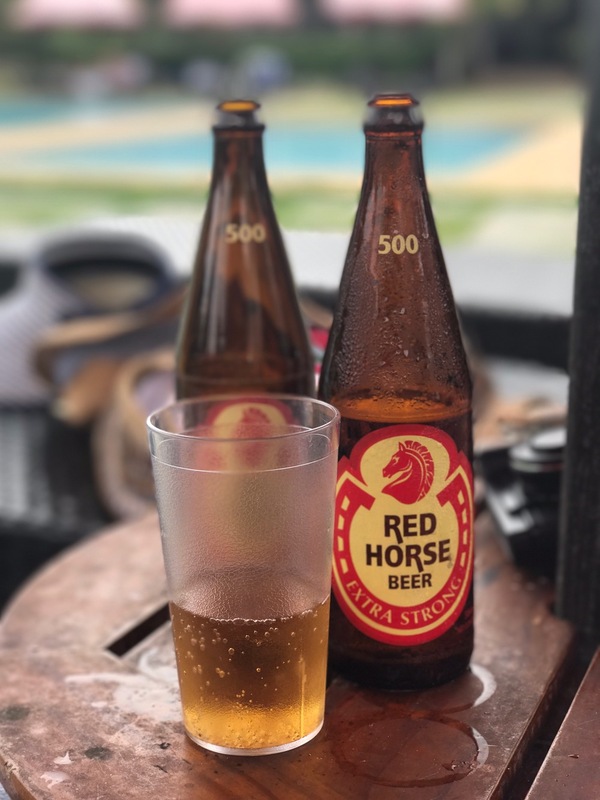 You have to drive North or South to experience a different perspective, the provincial life; You see the traffic jam, how locals live, and how the people are. First stop was CARCAR, this town is probably where everyone stops for a layover before proceeding to their destination. I showed them the shoe shops and boy, were they amazed. I thought they were all genuine leather but apparently they aren’t but still pretty good though. I bought myself a pair of sandals for PHP250. We drove to the wet market after to buy some of Carcar’s famous lechon. We all went down and walked around the market. They were so amazed to see all the different things in there. 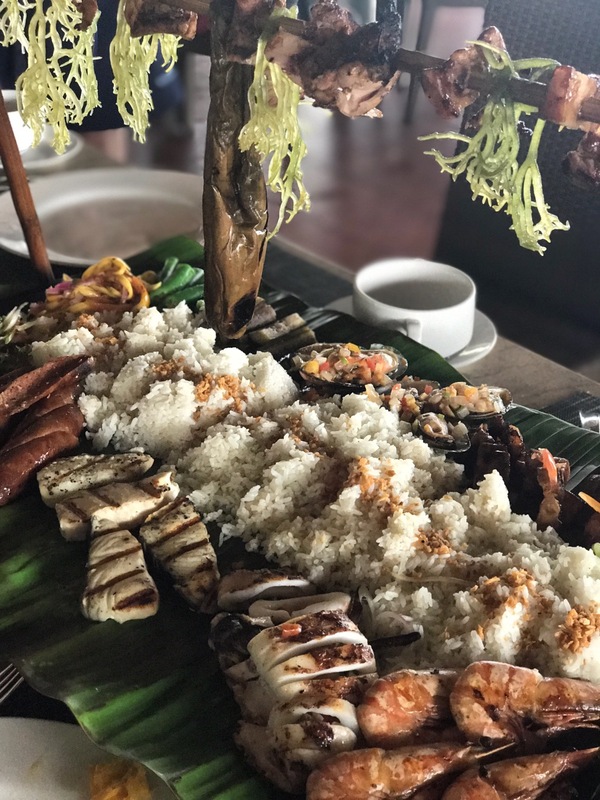 Seaweeds, the variety of fish and shellfish displayed on the tables, and my favorite, the lechon area, women stretch out their hands full of lechon pieces free for your taste buds to feast on! We bought 2 kilos of lechon with achara and puso (rice wrapped in coconut leaves). We drove to a nearby spot with a nice view of the beach and ate there. We were happy to eat in the car but the kind lady who owned the sarisari store right beside offered us a table and chairs, utensils, plates, cups and condiments –FOR FREE!- she was so lovely. We offered some money but she refused to receive it so we just bought some instant coffee and gave her PHP100 for it and we refused to get the change back. She knew we tricked her into accepting the money. This is the tallest mountain in Cebu standing at around 1000 meters. I’ve always talked about my mountain climbing craze in 2015 so Matt was excited to see at least one of the mountains I climbed. The easiest way to get to Osmena Peak is from Dalaguete. It was about a 20 minute drive detour from the main highway to get to Mantalungon town proper and another 10 minutes to reach the foot of the mountain. From there, it’s only a 20-minute hike up to the peak. EASY! I’m so happy how they’ve organized the place. There is a registration area with an entrance fee so they can monitor the people visiting and you get to go with a tour guide. These tour guides don’t get paid so they just depend on your tip. Our guide, Nanay, was so nice. My niece who hardly goes near strangers, felt comfortable with her, she even offered to carry her all the way to the top. We got there just in time for sunset and it was still as beautiful as I remembered it. It’s an easy trek- I was just in flipflops and did I mention we had a 5-month-old baby with us? My 5-year-old niece and Matt’s dad who has knee problems didn’t even complain. It was THAT easy. We stayed the night in Oslob at Down South 118 Beach Resort. PHP6,900 for 2 triple rooms. It was beautiful but the only complain I have was the noise at night. The walls were paper thin so you could hear all the trucks driving by at night and they also didn’t offer a crib for the baby. So we had to squeeze in on a double bed but aside from that, service was great, food was delicious and the sunrise view was just breathtaking. It was a 10 minute drive from the Whale Shark Watching area which made it very convenient. Wouldn’t let a trip to Cebu go by without swimming with the whale sharks. More details about Oslob in this link. We drove to Kawasan falls for lunch. This is probably the most famous falls in all of Cebu, made even more famous now with its canyoneering adventure. A lot of people say Kawasan has become too commercialized but I still think it’s beautiful. The water is still as blue. I think it is still more of nature’s touch than it is human’s. We hired the bamboo raft for 300 and paid another 300 for the guy to maneuver the raft for us. It was more expensive than I remembered but it’s all for the experience, right? I’ve done it a lot of times but I was still scared! They take you to the back of the falls and make you do different positions so the water can “massage” you but GEEZ it was painful! The impact of the water could literally break your back or neck. I had to shout “STOP!!!! !” more times than I should have. We ordered food at the restaurants there. The serving was good for 1 person and it took about 45 minutes for them to serve the food. We ended the day at 4:30pm to get back home at 7:30, just in time for dinner. To end the trip, we rested and spent two night in Mactan. We stayed in Shangrila nonetheless. We got a great deal with their voucher and because of a communication problem and a bit of an argument, they gave us a PHP10,000 credit. EVEN BETTER!! So we enjoyed drinks in Cowrie Cove, had dinner in Tides, and ordered snacks at their poolside bars. Now, that was a vacation! My son swam at the beach for the first time and we had a very proud moment as parents. Cebu, you’ll forever by my home. I love everything about you and I will miss you. It was a wonderful quality time spent with my family and Matt’s family. I’m happy everyone enjoyed the trip and best part of it all was seeing my friends and family. It was indeed, we should go back.